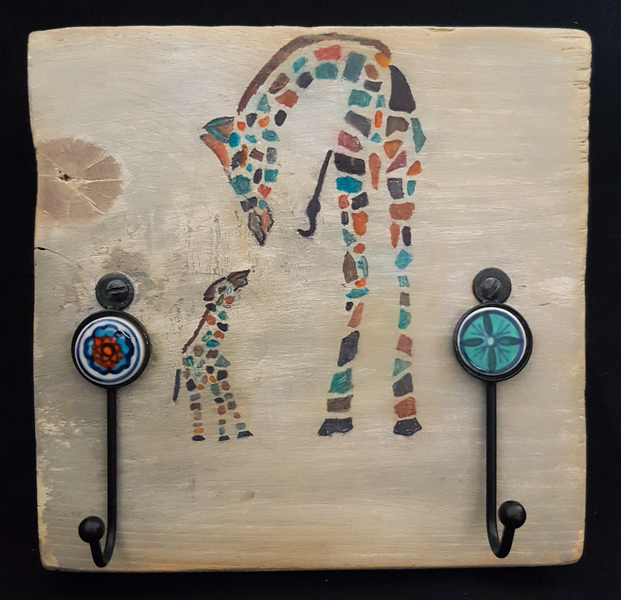 Mother and baby giraffes with two wall hooks made from recycled scaffold boards. The enamelled wall hooks are Fair Trade in orange and blue hues. The giraffes are hand painted in a stencil design with the body painted in black, blue and orange hues. 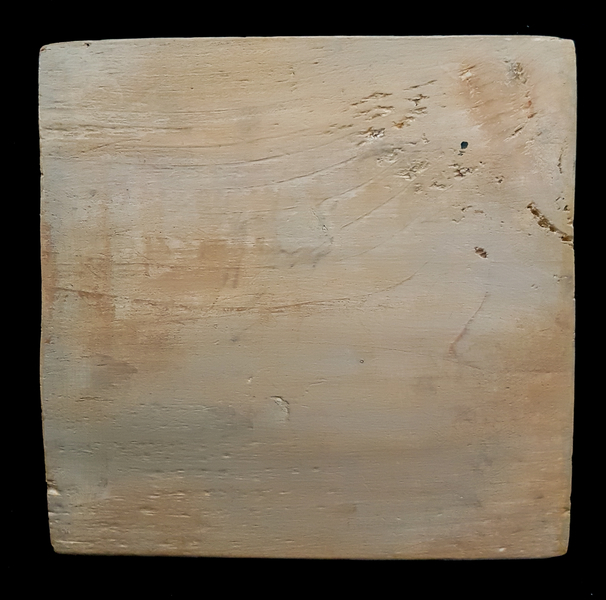 The board has been finished in ash varnish to give it a hint of the savannah. 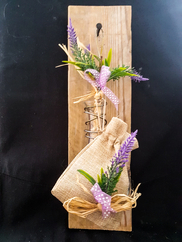 This cute wall hook is a great way to add personality to a room and it is useful for hanging utensils, keys, a dog lead, scarves, jackets, small plants, bags or umbrellas, or maybe use it to keep your shopping bags near the front door. Size: 19.25cm x 7.5cm x 18.7cm. Made from recycled scaffold boards and hand painted and varnished by us. Our boards have imperfections which we call character. We hope you agree. This wall hook comes with fixings to hang it on a nail on the wall. 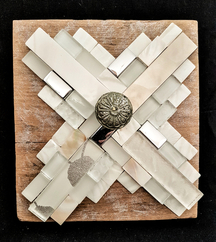 Akasha Artisan offers handcrafted, Fair Trade, vintage, up-cycled and re-purposed products. Got a question? Message Akasha Artisan. This coat rack is hand painted in large, pink flowers on a recycled scaffold board using acrylic paints. It is finished with two Fair Trade door knobs for hanging coats, scarves, dog leads, aprons, utensils.. 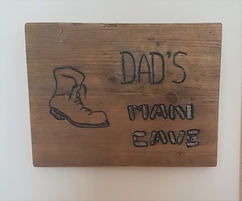 This man cave sign is made from a cut down recycled scaffold board. It is handpainted in acrylic paint with a picture of a boot. 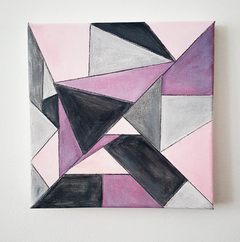 The boot represents the hard work Dad's do, whether paid work or working..
A small, original abstract artwork that features a trendy geometric design in pink, purple and grey. The artwork is painted on a canvas frame and is hand painted in watercolours. This artwork's contemporary.. 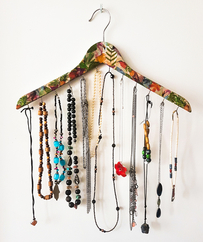 This jewellery holder is made from a recycled coat hanger with a decoupage jungle design and 10 hooks. 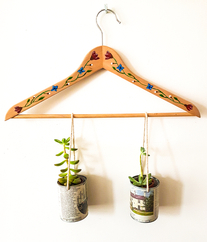 Keep your valuables together in one place with this simple but practical solution for small spaces..
Planter made from recycled coat hanger, tin cans and rope. The coat hanger is hand painted and the tin cans have been covered in a decoupage design featuring newspaper cuttings. 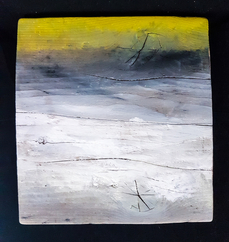 The succulents pictured..
Abstract painting in grey, yellow and white on a recycled scaffold board. This small piece of original artwork features a gradient of grey, white and yellow hues which match any decor. 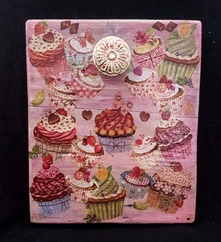 Add a bit of..
Cupcake themed wall hook made from recycled scaffold boards and finished with an enamelled Fair Trade metal door knob and a pretty decoupage cupcake design. 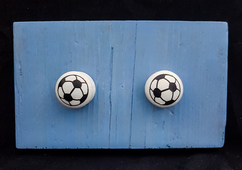 The back of the board is pink to match the..
Football themed wall hook for kids made from recycled scaffold boards with two wooden drawer knobs decorated with football decals. These are hand painted in acrylics and can be tailored to any team's.. 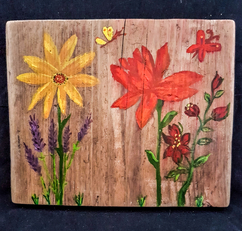 This painting of flowers and butterflies in reds, yellows, greens and purples is painted in acrylics on recycled scaffold board. Bring a splash of spring colour to your home in the knowledge that you.. This black wall hook with three stenciled flowers painted in acrylic and glitter in red, yellow and dark red is made from recycled scaffold board with a Fair Trade metal door knob. The wall hook is.. 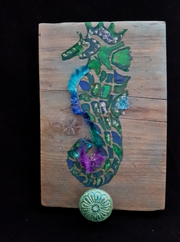 Cute, hand painted �Seahorse� design wall hook on a recycled scaffold board with a metal Fair Trade door knob in in blue, green and turquoise colours. 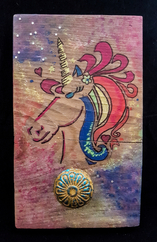 The seahorse has a soft fabric frill and was in fact..
Unicorn designed wall hook made from recycled scaffold boards with a Fair Trade metal door knob in multi colours of red, yellow, pink, blue, green and turquoise. This board has huge appeal with adults..